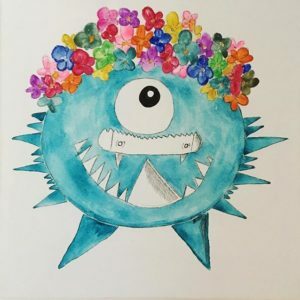 When Precious and Mary Ellen decided they wanted to make bookmarks to raise money for a charity they found the perfect cause, the Kathy Harding Library Fund. 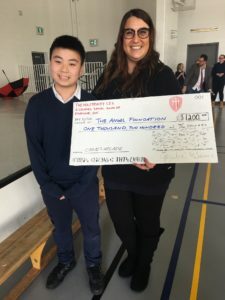 Every year this fund, a part of our Boards charity, The Angel Foundation for Learning, awards a grant to a needy school to buy books for their library. Enlisting the help of their classmates the girls made adorable, little bookmarks that they sold for .25 cents apiece. 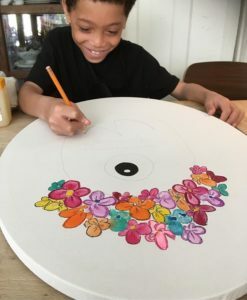 They were able to raise $103.00! 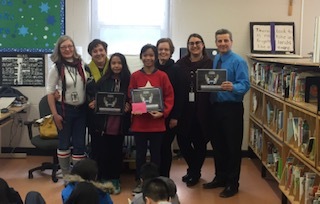 In recognition of their efforts Mary Ellen and Precious were presented with certificates of appreciation by Marisa Celenza, the Executive Director of the Angel Foundation, her colleague, Jennifer Tocci, and Kathy Harding. The presentation was done in the library with the rest of their class. 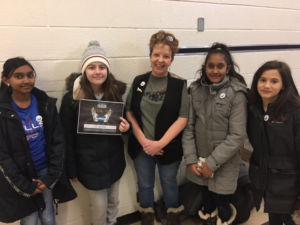 We are truly blessed to have such caring, motivated students in our community exemplifying their Catholicity and contributing to the common good. 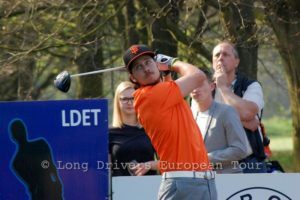 Cody Stout from @CharityGolf1 will be attending @AFLToronto golf tournament July 3rd – get your chance to watch him hit the longest drive for charity (best hit so far is 346 yards- registration is now open here! 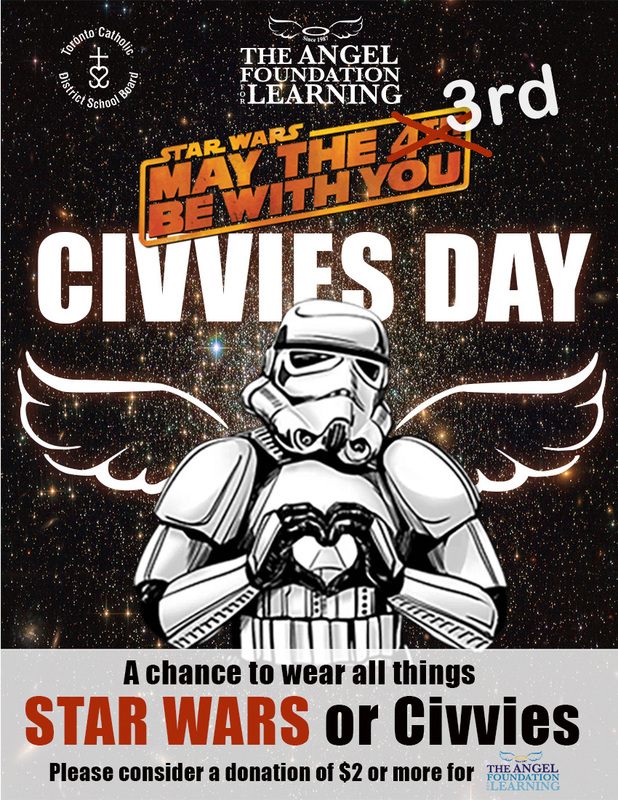 Using a photo from the Nasa website and other sources, the new May the 4th Be With You Civvies Day poster is ready! 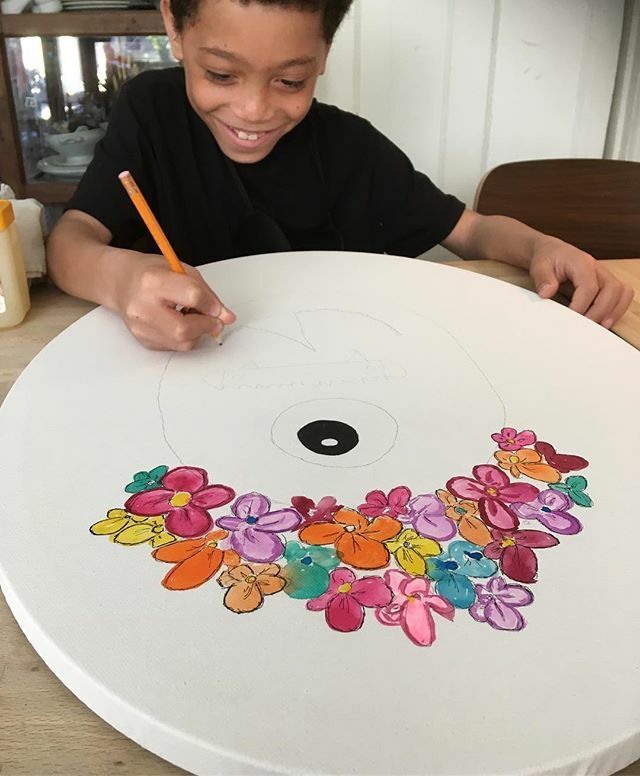 You can download a copy here. 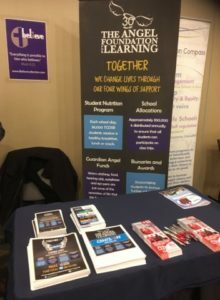 Great to be able to share our work with everyone at the Catholic School Chaplains of Ontario 2019 Conference. Jennifer Tocci, Office Manager for The Angel Foundation, picked up a cheque for $1200 from The Holy Trinity Catholic School who raised the money for the Angel Foundation by holding a Caine’s Arcade! 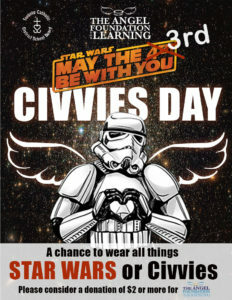 Sounds like a lot of fun and thank you for remembering us. 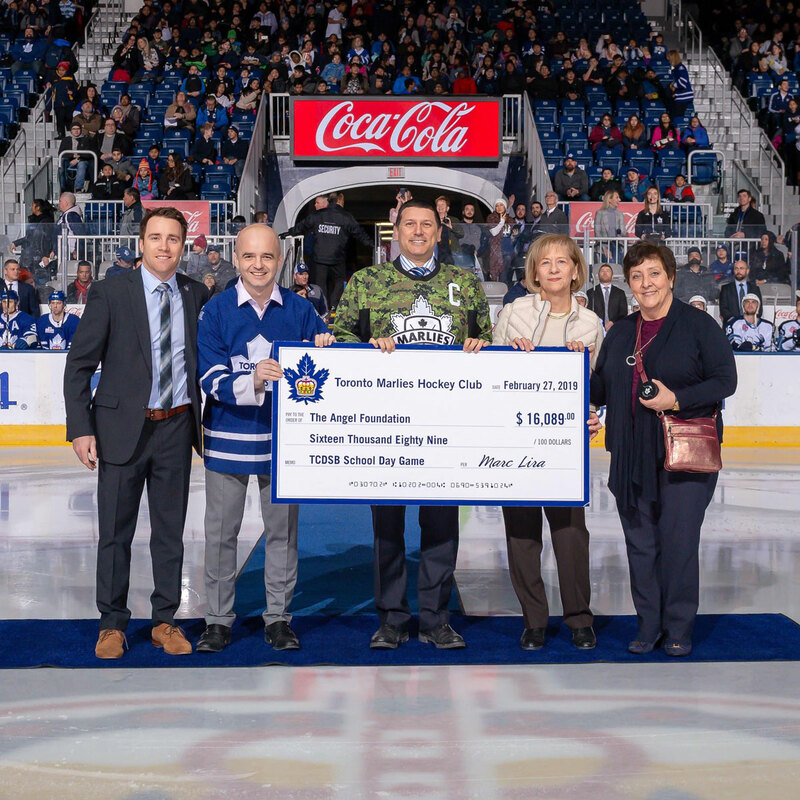 Thank you to everyone who came out to support The Angel Foundation for Learning Marlies Health Action Day game on February, 27. 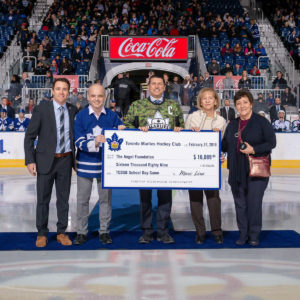 Your participation and the Marlies generosity generated $16,089 for us! Pat Martin visited St. Jerome to thank them for their toonies collected through Spirit Week to donate to The Angel Foundation for Learning. 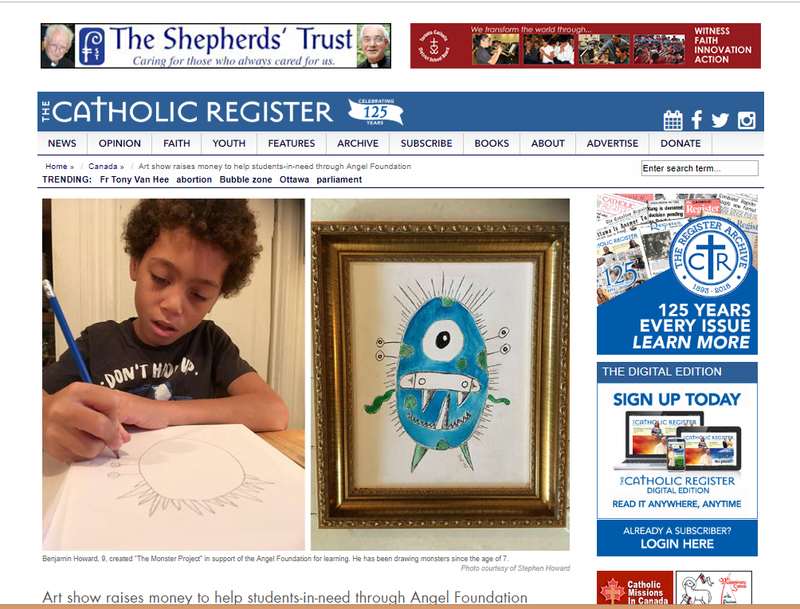 Excited to see the work of The Angel Foundation and some of the students participating in The Curiosities Art Show being highlighted in the Catholic Register.